June 14, 2016 – In 1936, the young star FU Orionis began gobbling material from its surrounding disk of gas and dust with a sudden voraciousness. 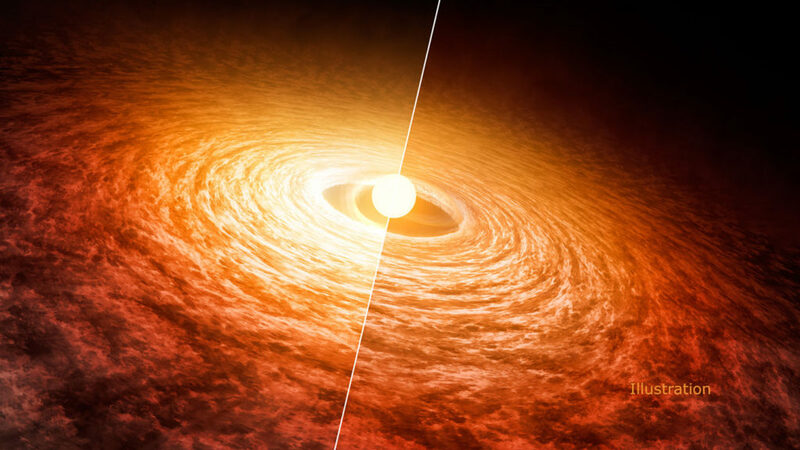 During a three-month binge, as matter turned into energy, the star became 100 times brighter, heating the disk around it to temperatures of up to 12,000 degrees Fahrenheit (7,000 Kelvin). FU Orionis is still devouring gas to this day, although not as quickly. Spitzer Space Telescope was built, integrated and tested at Lockheed Martin in Sunnyvale, California. Spacecraft operations are based at Lockheed Martin Space Systems Company, Littleton, Colorado. Ball Aerospace of Boulder, Colorado, built the Cryogenic Telescope Assembly — considered the “eyes” of Spitzer — and two of the three science instruments. NASA’s Jet Propulsion Laboratory, Pasadena, California, manages the Spitzer Space Telescope mission for NASA. Science operations are conducted at the Spitzer Science Center at Caltech. Data are archived at the Infrared Science Archive housed at IPAC at Caltech. Caltech manages JPL for NASA.